The Garden Journal: a free digital download made with your home printer. Easily assembled in a binder or it can be spiral-bound at your local copy center. Up today is a project I’ve wanted to do for a very long time, and I’m so glad this garden journal is finished. 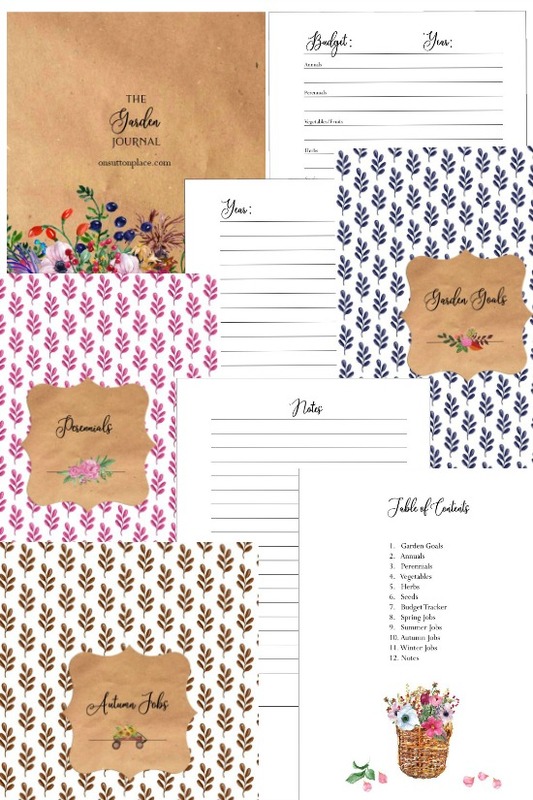 This journal is a free digital download that’s easy to print and assemble. 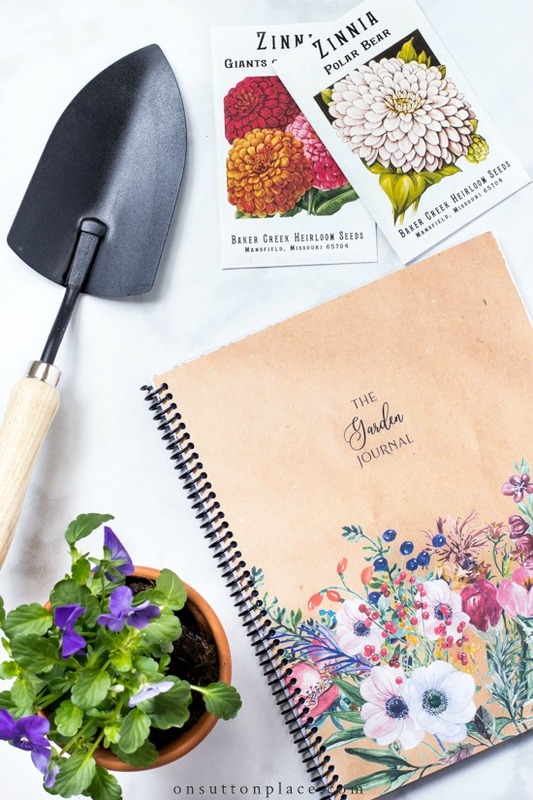 Any kind of journal is a personal thing…and a garden journal is no different. I designed this one so you can customize it to suit your own needs. For example, if you don’t start or plant seeds, just leave that section out. If you don’t do any gardening in the winter, leave that section out as well. My goal was to make this journal simple to use, and appropriate for both seasoned and new gardeners. 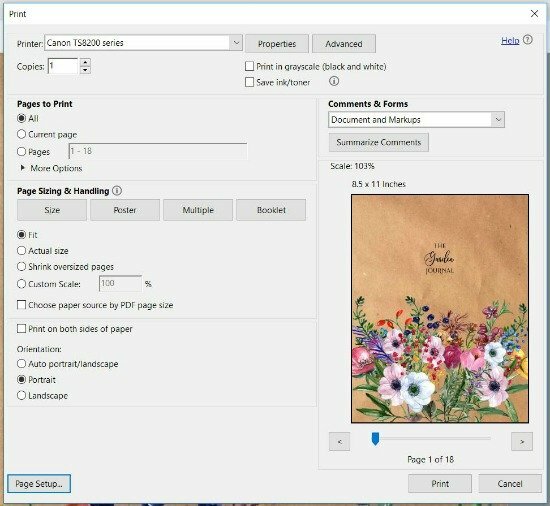 You can find detailed tips for printing and assembling your journal below. 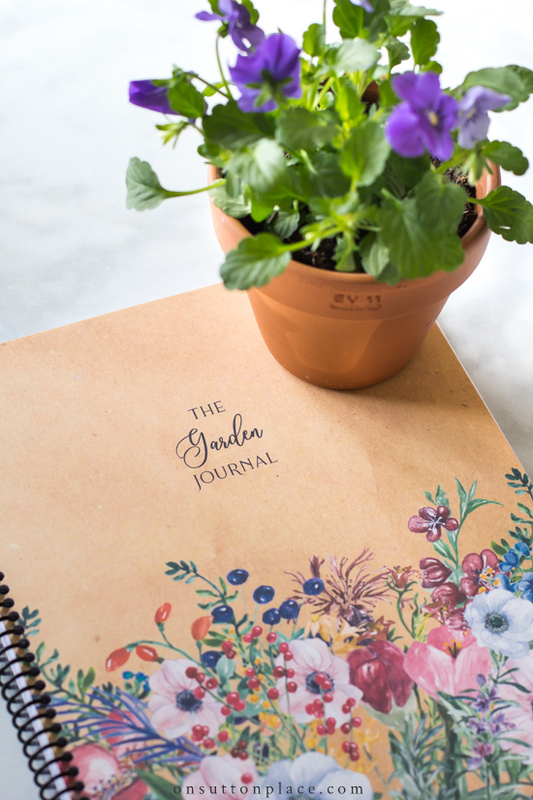 If you’ve never used a garden journal, I invite you to try this one. I had never used a garden journal before last year…and what I used was a tattered legal pad! I wish I had a record of everything I have ever planted, and the fact that I don’t is a huge regret. I plan on recording everything from now on. I recommend printing the first 16 pages on good quality white card stock. The final three lined pages in the PDF should be printed on regular copy paper. This file can be easily printed on your home computer, or save it to a flash drive and have a copy center print it for you. Install the free version of Adobe Acrobat Reader by clicking HERE. Make sure to uncheck the optional McAfee offers. Click the printer icon at the top of the page. Under ADDITIONAL FEATURES click Borderless Printing. A dropdown menu will appear. Choose card stock. Under Page Size & Handling, choose FIT. Your final window should look like the image below. Click PRINT. I thought for a long time about how to make the garden journal assembly easy and quick. Of course, you can assemble your journal any way you like. That is the beauty of a digital download. There are eleven sections. Each section is marked by a pretty divider page. Between the dividers, are lined pages for your notes and thoughts. If you would like assembly guidance, see the list below. 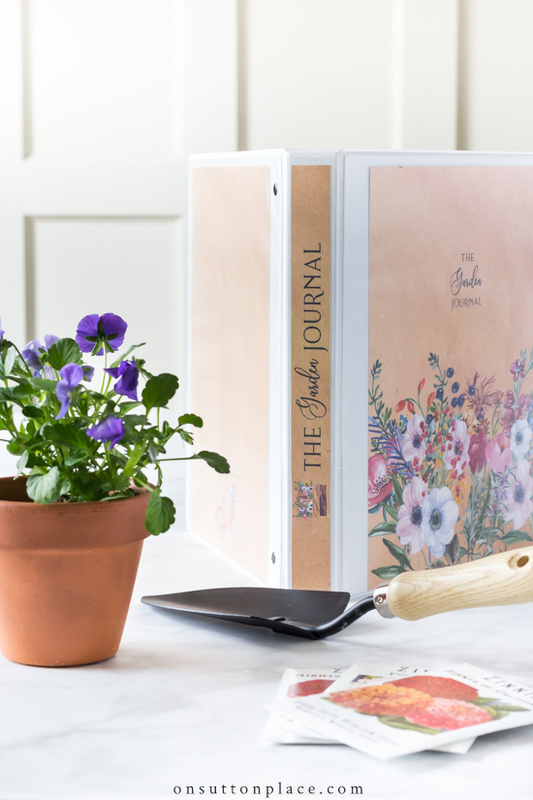 Once assembled, your garden journal can be placed in a 3-ring binder. (The binder spine is included in the PDF.) Another option is to have it spiral-bound at a copy center. I took mine to Staples and had it bound for just over $5.00. They placed a thin plastic cover on the front and back, which will help with wear over a five year time period. I’ve joined an amazing group of bloggers who also create free printables and you can find all their links below. Enjoy! This is so awesome Ann! I’m going to print several of this to give as Mother’s Day Gifts along with some seed packs and gardening gloves. Thank you so much! Thank You for the Lovely garden Journal. Here in the North… gardening is still in planning stages! Thank you so much for your Garden Journal – it’s just beautiful! I appreciate your instructions on how to put it together, and I’m looking forward to using it to make our garden one that I love to spend time in! How pretty! I kept a map when I was beginning to plan things out— it was a wonderful occupation for me during the winter when I couldn’t plant yet. This is a beautiful work of art and a boon for any gardener to use. I have already printed mine out and will punch in the holes and put it in my binder. You did an excellent job on designing this. I love the front cover and the “contents” pages! Love the whole thing! I did plant some perennials last fall and have more to go into the ground now. I will look forward to journaling my escapades this summer and into next winter. Thanks so much. Thank you so very much for this beautiful Garden Journal. Perfect timing. I appreciate all the hard work you put into making this gorgeous book. So very generous of you to share it with your subbies. Dear Ann, the Gardening Journal is beautiful. What a lot of work it must have been to create it! Wow! That journal is amazing. I can’t wait until planting season, coming soon I hope. Thanks for sharing. What a generous gift you have given all of us gardeners. I can hardly wait to print and assemble the journal. Our last frost date here in central NJ is May 15th then I can start buying plants and journaling like crazy. You’re a Sweetheart and I thank you. What a beautiful idea! I’m hoping to do more in the garden this year so this will be perfect! Oh, Ann! What a gem you have offered us today! I’m sure it was a labor of love for you. I’ve never kept a garden journal, but now that I am retired and can put more time into my garden, I think it might be time to do so. I’m know it would be something that I would enjoy and would refer to time and again. Thank you so much. Your journal cover is just beautiful. I have very little experience with printables, but I always save yours because if I ever do get around to using my printer I will have lots of projects waiting for me. Thanks for the step by step instructions, I will need them! Oh how lovely! I don’t have a garden but this beautiful journal makes me want to get started as soon as possible! Thank you! Thank you for this, it is lovely. I have kept a Garden Journal for years. Not as well organized as this I’m afraid. I have divided my large property into “room” to manage the work. Now, at 71, I am clearing some rooms! Can’t do it all any more. May your garden season be full of beautiful blooms, hearty tomatoes and no bugs! Well, except for pollinating bees! What a lovely friendship gift you have created for all of us. Thank you so much, Ann. Absolutely gorgeous resource. I can’t wait to to download this fabulous resource. It is just what I needed to keep track of our new landscaping plants, follow pruning and feeding schedules. Thank you so much, Ann. Love your blog and your decorating style. 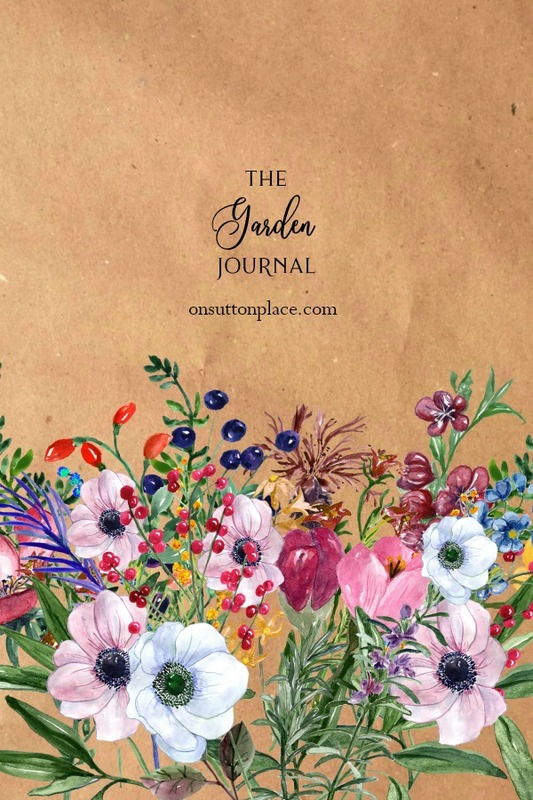 The Garden Journal is fabulous. Had one years ago, even tracked weather with it but after 5 years could not find another so did not continue and really missed it. Thank you, thank you, thank you. Love all the other printables you added to the end of the blog. You are truly the best and look forward to reading your blog. Sending a hug.